Xiahe is a tiny, bustling town nestles in a mountain valley at an elevation of 2,900m in Ganan Tibetan Autonomous Prefecture, southwest Gansu. The town was divided into two sections, primarily Hui (Muslim) and Han Chinese at its eastern end, changing abruptly to a Tibetan town as you climb westward to the gorgeous gilded roofs of the vast Labrang Monastery. Bent and walnut-visaged Tibetan pilgrims make you welcome on the 3km circuit around the monastery's perimeter. For backpackers, Xiahe is the traffic hub either northwards to Gansu (some places of it can be visited for Silk Road tour) or southwards to Sichuan. There is no railway lines anywhere close to Xiahe or the neighboring area. The only viable mode of transport to/from this Tibetan town is by bus. From Lanzhou: a few direct buses run to Xiahe daily, departing 6:30~7:30 and 14:00. But if there is only a few passengers, the driver may "sell" you at Linxia to the Linxia-Xiahe buses when stopping for lunch. If you missed the direct bus, you can take a Lanzhou-Linxia bus from either the east or south bus station in Lanzhou. From Linxia, buses to Xiahe departing every 40 minutes between 6:30 and 4:30pm, 3hrs. For those from Sichuan Zoige, you will need to come via Hezuo. Catch the 6:20am bus from Zoige to Hezuo, via Langmusi. Buses to Xiahe from Hezuo (2.5hrs) depart frequently before 4pm. There is also a direc bus from Langmusi to Xiahe. Leaving - The daily bus leaving Xiahe for Lanzhou departs in early morning. You can also go to Linxia,there are 2~3 buses per hour to Lanzhou between 6:30am and 4pm, about the same timetable for buses to Hezuo. Xiahe is also a starting point for travelers heading for Qinghai (famous tourist destination for China vacation deals). One daily bus leaves for Tongren (5hrs). However, due to poor road conditions, do not count too much on the punctuality of the bus, which is sometimes even cancelled. If you plan to go southward to Sichuan province, you can first take the morning bus to Hezuo and then change. 3-wheel motor-cab or bike. Bike renting service available at most tourist restaurants and hotels. The main Monastery Restaurant and the rental shop opposite offer the lowest rate at Y2/hour or Y10/day. For any additional travel-related information, head to the Youyi Hotel, who have travel services. Labrang Monastery - Built in 1709 by a monk from the nearby village of Ganjia, who became the first Living Buddha of the monastery. Situated at the foot of the Phoenix Mountain, 1.5km west of the Xiahe bus station, along the main road in town. In terms of size it is second only to the Potala Palace in Lhasa and it is so called by the Tibetan "Labrang", meaning the "place where the Buddhist Palace stands". The place remained in relative peace until the 1920s when the Muslims and Tibetans had numerous battles in and around this region, turf wars that were both bloody and prolonged. Again in the Cultural Revolution, the region was in chaos. Many of the over 4,000 monks "disappeared", the monastery was temporarily shut down, and was not reopened until 1980. Nowadays there are around 2,000 monks, mainly from Qinghai, Gansu, Sichuan, and Inner Mongolia. The present head monk, 3rd in religious importance behind the Dalai and Panchen Lamas, is the sixth incarnation of the Jiemuyang. The monastery consists of 18 resplendent halls, 6 prestigious Buddhist institutes and about 500 bedrooms for both the living Buddhas and ordinary monks. In total the monastery holds over 60,000 Tibetan sutras and thousands of rare Buddhist relics, including a statue of the most famous Tibetan king, Songtsen gampo. The Labrang Monastery holds seven large-scale summon ceremonies a year, among which the Summons Ceremony in the first lunar month and the Buddhist Doctrine Explaining Ritual in the seventh lunar month are the grandest ones. Sangke Grasslands - Lying about 14km west of Xiahe,it enjoys a good reputation in the northwest Tibetan region for its excellent pasture and frequent magnificent Buddhist ceremonies. Belonging to the meadow steppe and bordered by the Daxia River, Sangke Grassland is at an elevation of 3000m with an area of 70sqkm. The grassland is named for the summer-blooming Sangke flowers that form a natural carpet extending to the far horizons. Reflecting sky and mountains, the Daxia River twists through grass and earth like an undulating silk belt. Countless sheep, yaks and tents are visible over the prairie. Visitors can travel by bicycle or on horseback. It is possible to stay overnight with a local family or to rent a tent and experience Tibetan food such as yak-butter tea, stuffed steamed buns, mutton, and Zanba (a traditional Tibetan staple food of roasted highland barley flour). You can obtain other information via China tour guide. Although an impregnable pass cannot guarantee the victory of a war, it plays an important role. In ancient time when lots of wars happened, the pass will become a place of strategic importance. The following 6 are the famous impregnable passes in ancient China which you can choose for your China vacation deals. Located on the northeast part of Qinhuangdao City of Hebei Province, Shanhai Pass is the starting pass of the Great Wall built by great General Xuda in 1381 of Ming Dynasty. 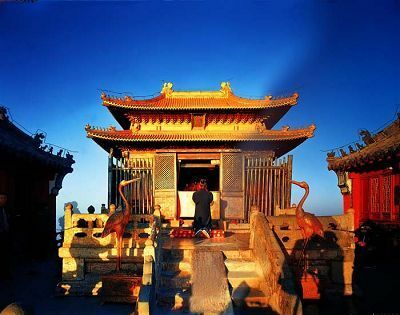 It is adjacent to Yanshan Mountain and Bohai Sea, so it was called Shanhai Pass (Mountain and Sea Pass). It is reputed as the first pass of China due to its key location. Situated on the Gouzhu Mountain of Shanxi Province, it was called Yanmen Pass (goose door pass) for the reason that it is between two peaks like a door and there often have geese flying through it. The mountains around it are very precipitous and the roads are all rugged, so it was an important pass in Song Dynasty. Yanmen, Ningwu and Pian Passed were called three passes, being in the charge of important town of Taiyuan and had placed key strategic positions. Located in northeast of Lintong County of Shaanxi Province whose capital city Xian is the starting point for Silk Road tours, Tong Pass is an essential pass between ancient Luoyang and Chang-an. It is adjacent to Yellow River to the north and Huashan Mountain to the south, not only a pass to the central Shaanxi Plain but also a natural barrier in the east of Chang-an. What’s more, it was in charge of the important Yellow River’s port---Fenglingdu Port between Shanxi and Shaanxi Provinces. Xiangyang is Xiangfan City of Hubei Province now, located in the middle reaches of Han River. It is a hinge area connecting Hubei, Henan, Sichuan and Shaanxi Provinces. During the period of Three Kingdoms, three military blocs had fought for it for several times. During Song Dynasty, Song garrisoned troops here for 10 years so that the Yuan Army could not defend Song dynasty. Called Pengcheng City in ancient time, it was an important town in eastern part of central plain of China, located in northwest of Jiangsu Province which is the best destination included in packages of top 10 China tours, adjacent to Henan, Shandong and Anhui Provinces. It was a place of strategic importance due to its special location of Huanghai to the east, Lunan Mountain to the north and Jianghuai River to the south. According to some historical materials, since period of Spring and Autumn and Warring States, there were more than 150 wars here. It is now located on the boundary of Sichuan, Shaanxi and Hubei Provinces. During the period of Three Kingdoms, Shu Nation occupied Hanzhong and it was a natural safeguard for attacking Wei Nation and defending the whole Sichuan Province. Between two peaks built a lot of plank roads. Therefore, it was easy to hold but hard to attack. If you are interested in the above places, you can include them in your popular China tour package. 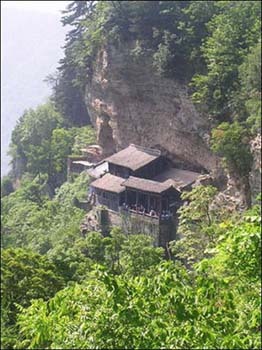 Wudang Mountain , situated in Shiyan ?City, Hubei Province, China, has been called the No. 1 Celestial Mountain in China and is always contained in top 10 China tour packages. It comprises of 7peaks, 36 cliffs and 24 valleys. Its main peak, called Heavenly Pillar Peak stands at a statuesque 1612m and together with the other mist-shrouded peaks, creates a spectacular vision. 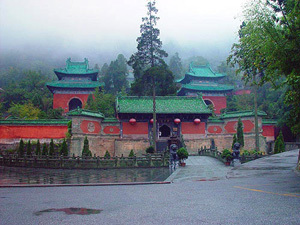 Wudang Moutain, with its natural beauty exquisite architecture and rich history, is worthwhile a detour from Wuhan. For its enchanting scenery and the legend of home of gods, many Taoists and hermits came to cultivate in Wudang Mountain, it was regarded as the origin place of China Taoism. Wudang?Mountain is honored across China with the sobriquet as “the first famous mountain under heaven.” Today, it’s recognized as an architectural achievement and in 1994, UNESCO bestowed Wudang Moutain World Cultural Heritage status. The Golden Palace is on the top of Heavenly Pillar Peak is the essence and symbol of Wudang Mountain (an optional destination for affordable China tours), the sign of Wudang Taoism coming to the highest peak under the support of the imperial families. The nucleus construction of Purple Cloud Palace, The Grand Hall is the only left double-eaved, lean-to-hill, wooden building. As one of the quite rare building of uplift wooden crossbeam construction in the history of the Taoist architecture, the Grand Hall is scientific and rational in structure and overall arrangement, harmonious and coherent in artistic style, united with surroundings as a whole, and unique in taste and features among the buildings in Wudang Moutain. Meanwhile, the Grand Hall, having absorbed the techniques of various times' artisans, demonstrated great achievements of architectures in Ming and Qing Dynasties, therefore, worthy of visiting and researching. 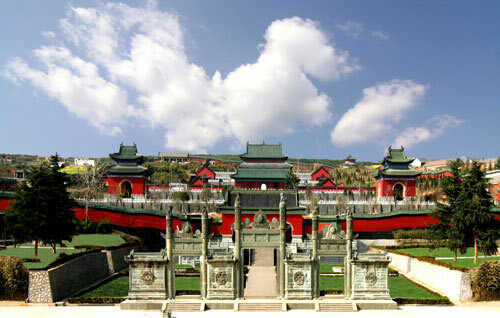 In the South Cliff View-site, the most famous architecture is a stone palace named the Tianyi zhenqing Palace . It's said that after Zhenwu ascended to heaven, he lived in a palace called the Tianyi Zhenqing Palace. Obviously the followers of Zhenwu on the earth built the palace. This stone palace is the one of the masterpieces of Chinese ancient architecture and is a representative of ancient Chinese stone buildings. The Tianyi Zhenqing Palace is made of wood-like stones. The roof beams, pillars, square timbers, windows, doors, joints and decorations of animal sculptures on the roof ridges, were carved from green stones and then combined together. The whole palace, accurately designed, delicately structured, and exquisitely carved, is a masterpiece of the large Chinese stone carvings. The difficulties of building this palace on the steep cliff stretch our imagination to the limit. The Tianyi zhenqing Palace was built by a famous Taoist Zhang-Shouqing at the beginning of the Yuan Dynasty?and was finished 27 years later. Zhang went to Wudang Mountain at the age of 30 and led his thousands of disciples to reclaim wasteland, plant the land and cut the cliff and then left this marvelous spectacle for the later generations. Opening hours: 7:00 a.m. ---- 7:00 p.m.
Spring, summers and autumns are the best seasons to visit Wudang Mountain. The moutain can be chilly near the top and be sure to have enough clothes for the nights. You can stay on the moutain, but most prefer the convenience of staying closer to the town , which is some 25km from the main peak. In early April and early October there are dragon boat races at Wudang Moutain on the Han River. Every October, the weeklong Wudang International Tourism Festival which is an important festival for China tourism takes place on the moutain with kung fu displays, photography exhibitions, and art exhibitions. ?